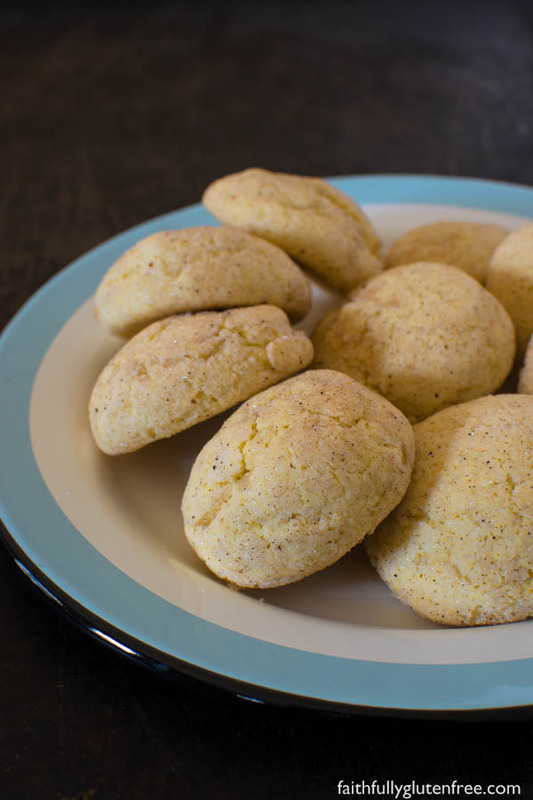 Gluten Free Pumpkin Snickerdoodles are like classic snickerdoodles that are transformed into a seasonal favourite with the addition of pumpkin puree and pumpkin spice. 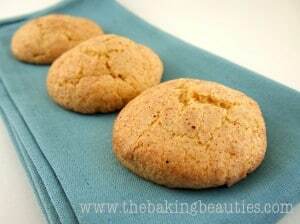 One of my husband’s favourite cookies is the classic Snickerdoodle cookie. I really don’t mind that, since it is such a simple, easy cookie to bake. No special ingredients are needed to bake them, the cinnamon and sugar that coats them is just enough. 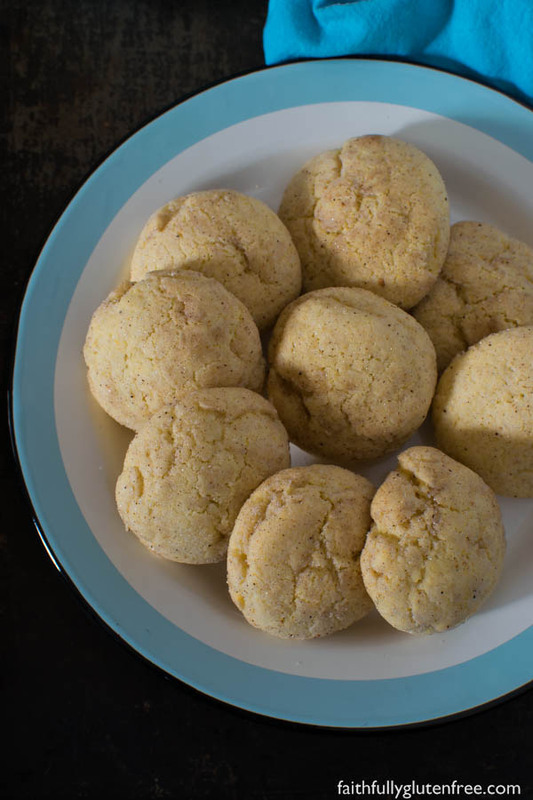 These gluten free Pumpkin Snickerdoodles take that same concept, but add some moisture to the cookies with the pumpkin puree, and the addition of nutmeg, cloves, and ginger from the pumpkin pie spice is wonderful. A moment of confession: I haven’t bought pumpkin pie spice in years. Instead, I make my own. It is really easy to do, and costs a lot less than buying a little tin of pre-blended spice, since I already have the individual spices on hand. You can make your own Pumpkin Pie Spice too, you won’t be disappointed. 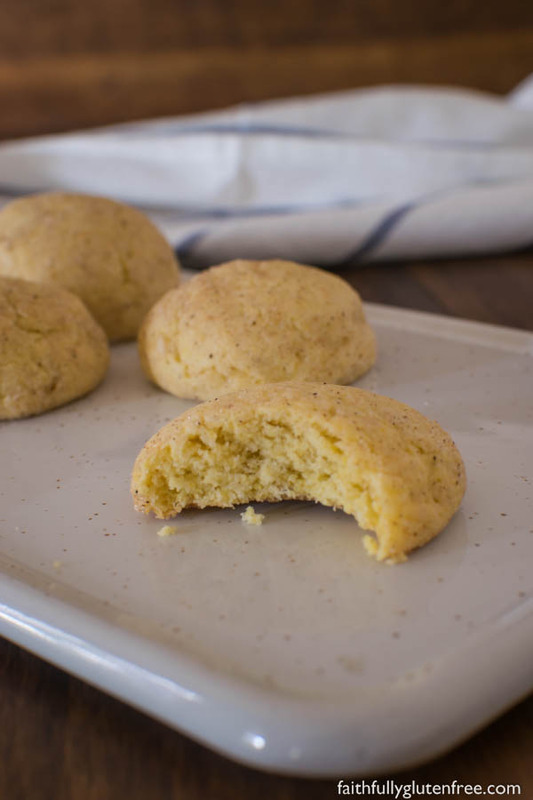 Gluten Free Pumpkin Snickerdoodles are great with a hot cup of coffee on a cool fall afternoon, but fancy enough that you can even make them to add to your holiday baking trays. I love that they are an economical cookie to make compared to some others. Sometimes holiday baking can be quite costly when you need special ingredients (caramels, nuts, baking chips, etc). Gluten Free Pumpkin Snickerdoodles are like classic snickerdoodles that are transformed into a seasonal favourite with the addition of pumpkin puree and pumpkin spice. The dough does require chilling, so plan ahead! In a stand mixer, fitted with a paddle attachment, beat the butter and 3/4 cup granulated sugar until light and fluffy. Add the pumpkin puree, egg and vanilla and beat until well mixed, scrape down the bowl and mix again. In a separate mixing bowl, whisk together the brown rice flour, potato starch, tapioca starch, baking powder, xanthan gum, cinnamon and salt. With the mixer running on low, slowly add the dry ingredients to the wet ingredients. Mix until well combined. Chill dough for 1 hour. Preheat your oven to 350 degrees F and line your baking sheets with parchment paper. In a small bowl, stir together the 1/2 cup granulated sugar and the pumpkin pie spice. Scoop dough into 1-inch balls (I use my small cookie scoop for this) and roll dough in the sugar/pumpkin pie mixture. Place cookies on prepared baking sheets, leaving about 2-inches between cookies, leaving room for the cookies to spread. Lightly press down on the tops of the cookies with the bottom of a drinking glass. Bake in the preheated oven for 10-14 minutes, or until the cookies are just starting to get lightly brown. Allow to cool on the pan for 5 minutes, before transferring to a cooling rack. Store in airtight containers once they are fully cooled. 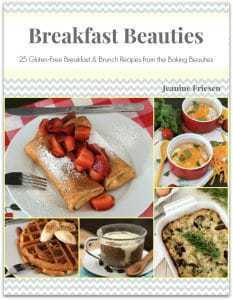 Recipe and images updated October 2018. 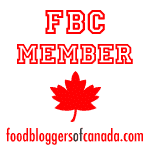 I was wondering if I could substitute the tapioca starch and use arrowroot. I have everything else. I am just practicing with some GF recipes. I don’t think that would be a problem, Charlotte! Happy Baking! Snickerdoodles were the very first thing I baked in my grade 7 Home Ec class (many many years ago! ), and they are still my favorite cookie. Can’t wait to try your variation! Made the Pumpkin Snickerdoodles. Mmmmmmmm… very good. We like the pumpkin and spice combination! Thanks so much! Nice! I’ve never tried the Bob’s Red Mill All-Purpose GF flour, glad to hear that it worked well though! Hubby is home and LOVES it! He usually doesn’t like oatmeal! Do I have to use xanthan gum??? If you are using an all purpose gluten-free flour that contains xanthan or guar gum, you don’t need to add it. Otherwise, it is added to help the dough mimic dough that contains gluten. It may work, they may just be crumblier than they should be. I just finished mixing up my batter. It’s really sticky! Is that normal? I’m hoping they turn out after some time in the refrigerator.